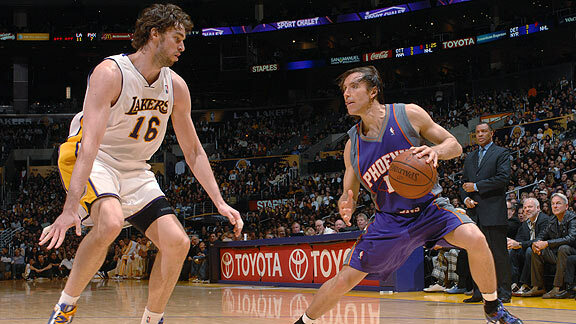 Photo by NBAE/Getty Images Steve Nash had 12 points and 10 assists, but the Suns couldn't keep up with the Lakers in L.A. The Phoenix Suns can't wait for Jan. 1 to roll around. It's not about New Year's Eve parties or watching college football. By the end of the month, the Suns will have gotten all of their games against the Boston Celtics, Cleveland Cavaliers and Orlando Magic out of the way. And they'll finally get a chance to take their home white uniforms off the hangars. Perhaps the Suns' 15-6 record should be graded on a curve. Their 108-88 loss to the Lakers in Los Angeles on Sunday night represented the Suns' 14th road game; that's twice as many as they've played at home. Their games against the Lakers, Nuggets, Magic and Cavaliers all came on the second night of a back-to-back set. "We've been on the road a lot; it's tough," Suns forward Grant Hill said. "We're a little tired of it. January, February, March look really good." That's when they'll play a total of 23 home games and 19 road games. How much of a difference does playing at U.S. Airways Center make to the Suns? Their home scoring average is 118.5 points per game. Road: 104.9 points per game. For a team so dependent on energy and fast tempo, it's clearly more conducive to play in front of the home fans instead of checking into a hotel room at 2:30 a.m., dragging through a morning shootaround, then taking the court against a hostile crowd. "We're not a grind-it-out team," Suns coach Alvin Gentry said. "We can't just pound it, pound it, pound it. The biggest asset we have is our speed and athletic ability. When our legs are a little tired, it catches up with us a little bit." The Lakers have caught the Suns on back-to-back games in both meetings and beat them by a combined 39 points. The Lakers' schedule has been the exact opposite of the Suns. They have played 15 of their 18 games at Staples Center; no other team has played more than 12 home games. They still have two more to go before they hit the road again. Of course, it's possible the Suns might not have any answers for the Lakers no matter how rested they are or where they play. The Lakers pounded Phoenix for 78 points in the paint in their first meeting, and when the Suns double-teamed the Lakers' big men Sunday night, the Lakers responded by making 10 of 21 3-pointers. The defense held the Suns to their lowest scoring output of the season. "We're not so much a fast-break team as we are a rhythm team, and they just take you out of your rhythm," Gentry said. "We've played the other teams, and I think they're by far the best team." It's an informed opinion, since the Suns have played every division leader except the Mavericks. If we have an idea of how good the Lakers are, we still don't know quite what to make of the Suns. They haven't come close in Orlando, Cleveland or Los Angeles. The Miami Heat just came into Staples Center on a back-to-back on Friday night and forced Kobe Bryant to make a miraculous shot to beat them, so the schedule can't take all the blame. The Suns did handle the Celtics in Boston. They've racked up about as many victories against teams with winning records as they have against teams with losing records. The Suns are tired of defending themselves against charges their style doesn't work in the playoffs (it might be the most defending they've done the past five years). One thing to consider is that they won't be subject to hectic travel or back-to-backs during the playoffs. In 2006, for example, they averaged 108 points in the regular season and 107 in the playoffs. The game doesn't automatically slow down just because the calendar turns to May; it's a matter of which team can impose its style on the game. The bad news for the Suns is they have to play the Lakers two more times. The good news is they're both at home, and only one more time after Dec. 28. So here's wishing them a happy 2010, Billy Ray Valentine style. LOS ANGELES -- Discussing the Los Angeles Lakers these days is an exercise in understatement. A healthy Pau Gasol has the team humming offensively. With Ron Artest smothering opponents on the wing, the Lakers are the league's third-ranked defense, giving up a mere 97.6 points per 100 possessions. Kobe Bryant, who has pretty much maximized his own talents, is now optimizing his teammates. At a certain point, there's little more for an observer to do than step back and applaud the choreography. On Sunday, the Lakers put on a beautiful exhibition of basketball in their 108-88 win over the Phoenix Suns. To underscore just how efficient the Lakers were offensively against Phoenix, those 108 points came on only 92 possessions. What the 16-3 Lakers are doing should certainly be appreciated statistically, but it should also be admired aesthetically. Right now, the reigning NBA champions are elevating their game to a platonic level. Fans at Staples Center on Sunday evening were treated to an exquisite display of half-court basketball: Bryant played high-low with the Lakers' bigs to perfection for easy buckets. Gasol, at the pinch post, lured Suns' defenders his way before flicking the right pass to the right cutter. Artest kept the ball moving from his spot on the wing, and led the Lakers with five assists. The grind of an NBA season doesn't give players much time to meditate on what their on-court product looks like from a spectator's standpoint. "It's hard to step back and reflect during the season because we're constantly critiquing ourselves," Lakers point guard Derek Fisher said. "But I guess it sticks out to me when I watch other teams play." "Pau is probably as skilled as any big guy in the league," Alvin Gentry said. "He's not the strongest guy. He's not the fastest guy. But his gamesmanship is unbelievable from the standpoint of his making plays out of the post position." One of the more sublime plays of the night came late in the third quarter when Lamar Odom delivered an entry pass into Gasol at the right elbow. The two big men completed the give-and-go when Gasol hit Odom in stride en route to the rack. The connection gave the Lakers a 17-point lead and sent the Suns scrambling toward their bench for a timeout. As a newcomer to the Lakers, Artest might be the best candidate to appraise the team artistically. Has he ever played on a squad that played a prettier brand of basketball? "As far as the game of basketball, this is the best-looking team," Artest said. "But as far as the guys go, it's one of the ugliest teams." The Lakers may not be wall calendar material -- but for good measure, go ahead and circle the first week in June. To read more, check out Arnovitz's TrueHoop Network blog, Clipperblog. The Cavaliers posted a 101-86 victory at Milwaukee despite being outscored by 18 points with Shaquille O'Neal on the floor (39-21). Over the last 10 seasons, only two other starting centers were minus-15 or worse in a victory of 15 or more points: Kwame Brown for the Lakers in 2006 (minus-15 in a 111-94 win over the Timberwolves) and Mark Blount for the Celtics in 2001 (minus-16 in a 113-98 win over the Nets). Dwyane Wade, Heat: Miami ended its two-game losing streak thanks to Wade's 34 points, five assists and 10 rebounds. Milwaukee Bucks: They allowed the Cavaliers to score 29 unanswered points -- the biggest scoreless streak in the NBA this season. "The biggest thing I was saying to the guys was we can't lose to the Nets." Delonte West fired in 14 of his 21 points during a 29-0 run by the Cavaliers in their 101-86 win against the Bucks. 8.What's Going On With Wizards? Flip Saunders commemorated his return to Detroit with a polka-dotted tie. Just like his garment, the Wizards' play in a 98-94 loss to the Pistons was spotty. Again they failed to value the basketball. At 7-12, the Wizards are still one game shy of Saunders' proclaimed 20-game initial evaluation period. But with the sample to date, it's clear the cement might be starting to dry on the Big Three of Gilbert Arenas, Caron Butler and Antawn Jamison. Far from contention, and akin to Washington's Redskins having hung offseason banner after offseason banner, the District's NBA franchise has recently rested its laurels on character, commitment and connection, and all was copacetic for half a season in 2006-07. The current Wizards are playing like a team assembled according to height on the first day of basketball camp. Sure, injuries, a new coach and the return of the team's biggest star after a two-year absence are significant challenges, but they don't explain the lost will to win. Against Detroit, the Wizards committed 17 turnovers to 15 assists, the seventh time this season they've had an assist-to-turnover ratio of 1-1 or worse. That failure to manage possessions, combined with consistent inconsistency and the all-too-familiar inability to find energy, equates to a situation that just isn't working out. With supporting-cast changes and bountiful preseason positivity from Jamison and Butler resulting in fleeting aspirations, the heart of this team is in need of resuscitation. Time for Ernie Grunfeld to break out the defibrillator of managerial bartering. An ownership group in uncertainty clouds the water. Grunfeld's days as team president aren't numbered, but he might need drastic change to keep in good standing with potential new owner Ted Leonsis. Not all is lost for the franchise that's been called the "Clippers of the East," but the true mettle of this franchise will be tested mightily in the coming months. To read more, check out Weidie's TrueHoop Network blog, Truth About It. When the Heat added veteran (and I do mean veteran) swingman Quentin Richardson, the only ripple it really garnered was a large number of jokes about how many times he'd been passed around. After moving from the Knicks, to the Grizzlies, to the Clippers, to the Timberwolves, to the Heat, all in a span of less than three months, he was considered a novelty for all his travels. Many looked at what was a lackluster 2008-09 Heat squad that was perceived as somewhat of an overachiever thanks to Dwyane Wade's MVP-level magic, and wrote off the Heat for this season. Predictions of a downturn in wins and production were rampant, with the idea that Wade's inevitable fall back to Earth to any degree would sink the Heat's chances of winning. Surprisingly, though, Richardson has become a difference-maker on and off the floor for the Heat. He immediately bonded with Dwyane Wade, being referred to on Twitter along with Dorrell Wright as a member of a clique called the 1-3-5. On the floor, the impact has been even greater. For the season, Richardson entered Sunday night shooting 41 percent from the arc, averaging 11.2 points per 40 minutes as a role player. A more interesting stat? The Heat dismantled the Kings in Arco Arena on Sunday, behind the eye-catching 30-point, 10-assist, 5-rebound, 4-block performance by Wade, and the less noticeable 20-point night from Richardson. After Sunday, the Heat are now 4-2 when Richardson scores at least 10 points. Richardson allows the Heat to space the floor and provides Wade with a veteran shooter he can trust on the perimeter. After years of feeling like he was baby-sitting the Heat's younger role players, finding Richardson has paid off so far for the Heat. And Richardson may have finally found a home. Yesterday's trash is today's valuable swingman, apparently.